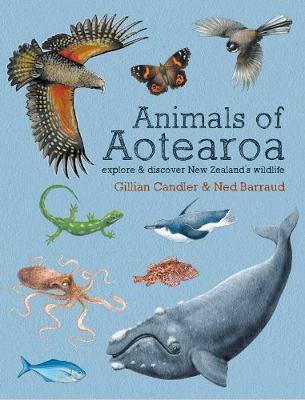 Animals of Aotearoa is a must-have compendium for children curious about New Zealand's wild animals. Based on the award-winning and best-selling `Explore and Discover' children's series about New Zealand's natural history, this book is packed full of illustrations and information... read full description below. Animals of Aotearoa is a must-have compendium for children curious about New Zealand's wild animals. Based on the award-winning and best-selling `Explore and Discover' children's series about New Zealand's natural history, this book is packed full of illustrations and information about our native animals, both common and rare, as well as many well-known introduced animals. The book includes land and sea birds, frogs and lizards, many kinds of fish and other marine creatures, insects and invertebrates. This is an essential and beautiful reference book for all New Zealand kids. Children can pore over the pages on their own or read it with an adult, but with such engaging images and fun facts, this is a reference book we will all wish we'd had as a child. GILLIAN CANDLER is an award-winning writer for children. She enjoys encouraging children's curiosity, observation and wonder for the natural world. Gillian has a passion for nature and is a keen conservation volunteer. Her involvement in conservation projects has seen her identifying geckos and skinks, feeding fairy prion chicks, counting birds, making seed balls and trapping pests. Gillian blogs about nature at ExploreDiscoverNature.blogspot.co.nz. She has a background in teaching and educational publishing. NED BARRAUD is an illustrator with a keen passion for the natural world. He illustrated the six previous titles in the award-winning `Explore & Discover' series, along with his children's fiction titles, Moonman (2014) and Watch Out for the Weka (2017). When not illustrating, he works on films at Weta Digital as a texture artist and enjoys exploring the outdoors with his wife and three children.